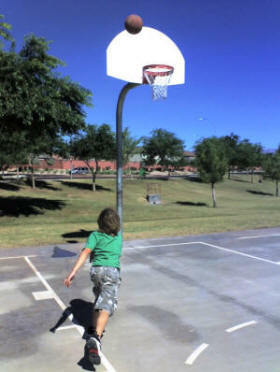 Shooting hoops with my grandson. 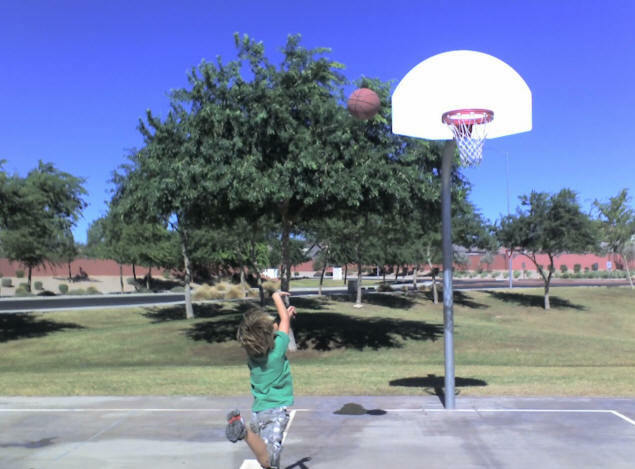 After he'd spent four hours or so playing video games on a beautiful Saturday, and insisted there was "nothing to do" outside, the entire family was forced to rouse itself up off the sofa and go with Zachary to the neighborhood basketball court to shoot some hoops with him. I am not a basketball player. 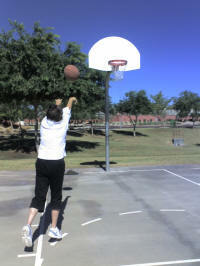 I never even held a basketball until I was in high school; and then it was awkwardly. So imagine my surprise to see little eight-year-old Zach sink basket after basket. It turns out that in third grade—third grade!—they spend time throwing basketballs around. It just goes to show you what an early start can do.He also knew all these game variants for us to play, like "Around The World". Obviously his physical education teacher is succeeding in developing a love for and joy in sports that never occurred to mine. P.S. Even Grandma joined in the action! And did pretty darned good, too! This was the first weekend of the year that was delightfully cool enough to be able to go out and play at anything not involving water. It's really nice to be moving into the double-digits again. 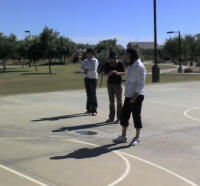 We are now in that part of the year that living in Central Arizona is pleasant. This is the time of year we try to recall in the summer when we envy soldiers in Iraq for having deal with balmy temperatures like 110°. So, who knows? We might go out and play again next weekend!